With this release we are submitting updates to the new Profile and Dashboard, and announcing any changes we have recently made. Reduced number of posts shown in recently viewed. Added filter to show only your recent activity, or you and your friends’ recent activity. Avatar images are back to a square shape. Deployed performance improvements to make the page load faster. It is now possible to link to individual tabs. Added the option to use email from the Profile back. The “About” tab on the Profile will return to its former position as the default tab. Adding functionality to collapse sections in the newsfeed that aren’t relevant to you. Jayme from HQ’s Product Team and Dave from HQs Engineering Team will be watching the thread to answer questions whenever possible. Any posts in this thread should relate to features in this release. Please direct unrelated comments to other appropriate threads. Thanks! I think this bullet should actually be in the "Dashboard" section, not the "Profile" section. Avatar images on Profiles are still circular, but my avatar is square on my Dashboard page. I thought that it used to be possible to select one of your past avatar images, and to make it your current avatar image again, without uploading it again. I couldn't find this capability. 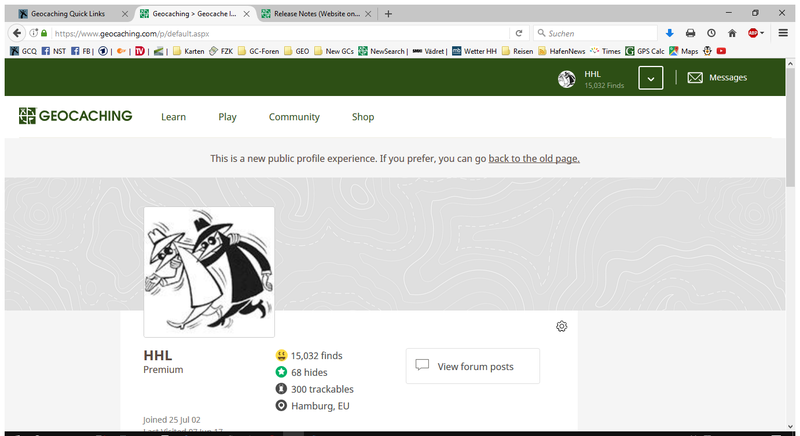 And my avatar is square again on my dashboard, but on my profile page, I still see an enlarged round version of my avatar. Lookin' better all the time. A suggestion for the Recent Logs list. When you select Community, the list shows every user's avatar. When you select Yours, it doesn't. Of course, in the latter case it's only going to be your own avatar over and over, but I'd like to suggest you show it anyway. I would make it so obvious at a glance what you're looking at. ETA and unrelated: It may have already been suggested, but could we split the "Found CacheName" into two parts? With "Found" being a link to the log, and "CacheName" being a link to the cache page? There seems to be some inconsistency between the "Yours" and "Community" filters on the Recent Logs section. On "Community", avatars are shown beside each log. When I switch to "Yours", I can briefly see my own avatar in those spots for a split-second, but then they all disappear. I'd expect avatars to either show in both filters or be hidden in both filters. There are still layout issues that cause too many useful features to be pushed below-the-fold, including unnecessary white space, overly-large "Recently Viewed" records (use the smaller icon and combine info into one line), etc. Inconsistency and loss of context in the Recent Logs section. There needs to be a log type icon as well as a cache type icon, and the behaviour needs to be consistent for all log types. The section headings on the left side menu aren't obviously headings. They should be made more distinct either through text formatting or separating them as per the mockup posted by thebruce0 in the previous release notes. The ability (whether by default or at least as an option) to show as much as 30 days of Recent Logs in order to mirror the old dashboard's functionality. Do you know what's causing the performance issues? The old dashboard never seemed to have any trouble retrieving the recent logs, even if there was a pretty significant number of them. The new page seems to struggle to retrieve and display just a couple of dozen. Is it using more expensive database queries now? Is it using some new technology that just isn't quite as efficient? Is it just the display phase that's slow to load? 2. Recent logs: YES, no further friends logs! Thanks a lot But again, way too space wasting compared to the old style. Plus way less info/links. Still just the link to the log while I in most cases want to get to the cache and not my log. Also missing all the logs from the last 30 days. Today the actuals logs don't even show the full day I guess. 3. "Yours": it makes sense to have that option at this place but I don't get that this also is the place for "Manage preferences" as I would expect this to be shown somewhere within the left menu. In addition there seems to be a slight flaw while showing discover logs. Mine show something like "Discovered Old Wine Barrel at". But where is the "at" part? All in all the new version is still not working for me as I'm simply missing about everything I am using from the old dashboard! On Chrome, it was square when I installed the new avatar, but now it's circular again,and is cutting off my tail! Used to was that all my past avatars were stored on Groundspeak. Now installing a new one takes me to the photos on my computer. My past avatars are gone. It is a fair question and one that we are very aware of. Most of the existing website was/is full stack and included everything from the CSS down to the database access. Queries were written that were tied to specific pages or components within a page. Fast forward 5-10 years and we are left with a very large code base with business logic scattered throughout the entire stack which makes maintenance and updates very difficult. As an internal initiative we are working on removing business logic from the website and moving it into APIs that different systems (including the website) can consume. This allows us to consolidate logic into a single place - pretty standard. This process has been happening behind the scenes over the course of the last couple of years on various subsystems. Through performance tuning and data caching we can meet or exceed existing performance and increase code maintainability. Now, on the Dashboard, instead of calling a single highly specialized query we are calling several APIs to piece together the data for the Recent Logs. We are cognizant of performance and work to optimize everything, but the Recent Logs needs to pull from too many data sources to piece together the full list. Every call to an individual data source is fast, but the cumulative time for all the calls combined becomes painfully noticeable in some cases. There may come a time when we want to show more information in that section, but the current system cannot possibly support anything else. It is for this reason that we are already in the process of creating a new subsystem that is highly optimized for this data, but is part of the new centralized infrastructure. The developers are making great progress on getting the new system in place with the goal that we will swap out the current system with the new one and significantly increase performance. I know that for some people the performance has been problematic and perhaps made the Recent Logs section unusable. I sincerely apologize for that poor experience and hope that you will give the new system a try when it is available. For discussion's sake (ETA: and I composed this comment while HiddenGnome was writing the previous response ), I'm working up a solution to this in my work's intranet. When moving from a single-request page load to an asynchronous lazy load, you change from 1-request to multi-request, just to fill the page content. In 1 request, all the objects and values used to generate the page are initialized and calculated once. For a multi-request page, each request may need to initialize all everything too as they're each basically independent of each other. Without optimizing the request process (depending on however the backend is set up), that could make the page load take perceptably longer. It could take some tricky coding to do one big initialization and have followup distinct asynchronous requests use that process in generating the same page. That's one tradeoff of excessive lazy load page content... If done optimally, it's great and snappy; getting there can be tricky. To the updates - that's a great list of changes! A big step forward. Still a little concerned that whitespace is still so significant, but the log-created-date comment was a little late to the party, so maybe that can be addressed for the next release update? mebbeplz? All these improvements and I've still not seen the recently viewed caches on the new dashboard. Across five different browsers, on two different computers, it has _never_ successfully loaded. Here's what my dashboard looks like on my tablet. I suspect this isn't as intended. On my PC I notice that there is a settings "gear" icon on the profile page, as well as the settings in the drop-down next to the user name. On the dashboard, there isn't a settings icon on the actual page. It would be nice to have one in with the Statistics and Souvenirs links. Instead of making the "about" tab the default for everyone, how about letting each user choose their own default tab? I would pick "About" so the proposed change suits me, but others may not want huge profiles as their default. My friends logs have gone, which is an improvement, but is there a plan to make each friend selectable, both regarding whether their logs appear at all and which log types are displayed? And I personally like it thanks for work. Sad. I liked to see the important information first and not the selfish statistics and banner rubbish. The rest of the changes are nice. Finally an option to omit friends' logs, great news for many! Those rectangular avatars with rounded corners also look cute. This! the Map button now on the right panel is the link I use most often. I don't go via the menu at the top because it requires two clicks. Same with lists and pocket queries. Those are the two things I use most often after the map, and they should certainly be easily accessible as well. Combine the lines of metadata in Recently Viewed into one line, and reduce the whitespace. I do actually use Recently Viewed so collapsing it isn't a great option. Return the number of entries in Recent Logs to 30 days. If that's not acceptable because of server load issues then use lazy loading to extend the list as it is scrolled. Now I can shut off the list of friends' logs. Once done I don't need to be reminded on every line that it's my log so drop the 'You' on every line and reduce the whitespace. Please give me a link to the cache, as well as a link to the log if need be. A link to the cache is far more useful, so if it has to be one or the other, lose the link to the log. Reading the responses to the recent changes, the one thing that seems to be provoking most comment is the amount of wasted space. This seems to be thing that hasn't been addressed at all. Since changing it involves a tweak or two to a style sheet I assume that there's some ideology at work here. I understand that you feel that the product needs a facelift but please don't get drawn into a 'fashion over function' theology and give us a product that is universally disliked. Ok, I'm having another look at this. I can't work with graphics, so please bear with me. I'm on a 28" monitor at work, 14" notebook at home. On my work monitor I can see 5 recently viewed caches plus 1.5 recent logs. There is just so much whitespace. Three lines plus additional space above and below for recently viewed caches is too much, and while I'm an information junky I wonder if all this information is really necessary. For me, just the cache type and name has always been sufficient. Yes, there needs to be a link to the map right at the top. The Statistics and Souvenirs buttons are a bit useless as one can get there as well by clicking on the View Profile link. 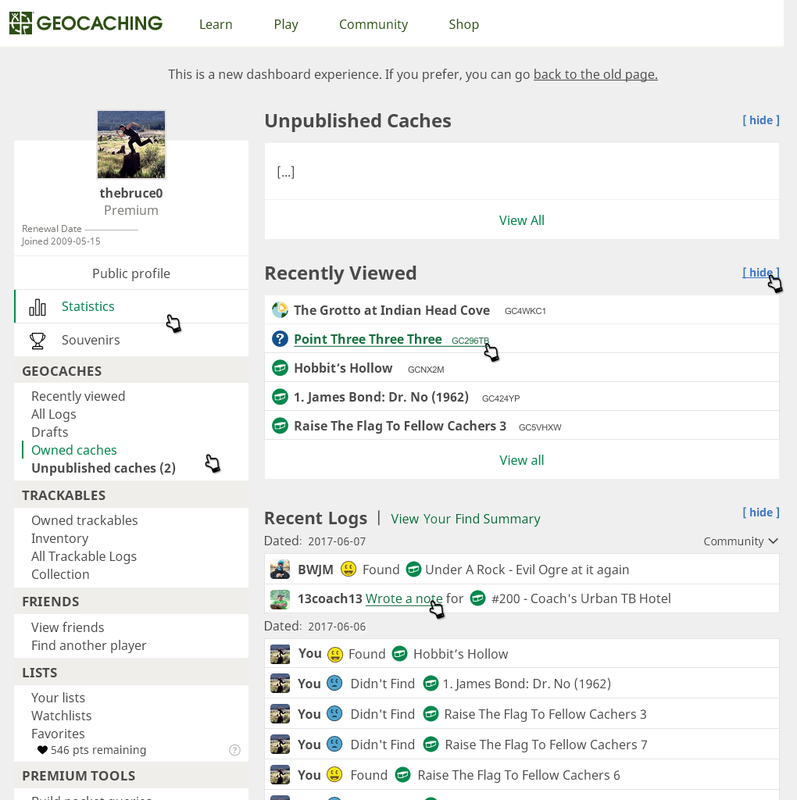 The next three sections, Geocaches, Trackables and Friends are not really useful tools for using the website. Geocache could for example include a link to Search. Trackable is missing the most important thing: log/find a trackable. Friends.. well, ok. I don't need it but that's just me. The really useful things for planning caching trips only comes below: Lists and Pocketqueries. There is no way to create a list from here, neither on the new lists overview. This is as annoying as the photoalbum feature on Facebook: I cannot create a new album unless I upload a photo at the same time. But if I create a list from the map I cannot give it a description. Sometimes I just create a list as a reminder that I still need to select caches. When I create the list I don't know yet what will go inside. The new Dashboard is a huge waste of space, with nearly everything I actually use 3 full screens down. Currently much of what's useful is in the quick view horizontal line at the top, with only a partial down scroll for map and PQ. I've never cared for Recently viewed, and would love to be able to collapse it - certainly on the new dashboard, it's terribly bloated. Open up the old Dashboard and new Dashboard side by side. The old page is really a dashboard with all critical info (links and data) at the top. Not so for the new dashboard where I need to scroll an entire page on a 17" Macbook to see all the links. Lazy load is fine for secondary data. Load the critical "above the fold" data as part of the page and lay load secondary data. Don't make the 2 most prominent elements on the page lazy load or appropriately deprioritize the value of that data to secondary and BELOW the primary data loaded as part of the base page such as the navigation. For me it's exactly the other way round I like to see these statistics and rarely care about the geocache overview. But as tastes are different I already was asking for an adjustable "main page" so I could see the statistics and you could see the geocaches! The Statistics and Souvenirs buttons are a bit useless as one can get there as well by clicking on the View Profile link. Trackable is missing the most important thing: log/find a trackable. Friends.. well, ok. I don't need it but that's just me. Please be aware that the Statistics on the Dashboard and the Statistics in your public profile are not the same thing. The dashboard link is where you customize what is seen in your public profile. I have certain things hidden in my public profile but am able to see all my statistics by clicking that button in the dashboard. I happen to prefer the public profile sort the new way but if it must go back to "About" being the first tab I'll understand. Personally, I wish I could customize the profile so they all showed in the order that I would prefer but I'll live with whatever you decide. I agree a link to log a trackable would be very useful. I am also very happy the ability has been added to only view my recent logs. Thanks for listening. As far as the display on a tablet or smart phone I used this new dashboard a lot while at GeoWoodstock and actually found it much easier to use and navigate through than the old way. I like it that the recently viewed and recent logs DO NOT display on my device since I don't need them and there are other ways to get to them if I really want to see them. I'm happy now that when I go to [Logs] from the Dashboard I now have access to the different filters (All Logs, Found It, Attended, etc). This, for me, is the biggest thing I use my profile for. The "About" tab on the Profile will return to its former position as the default tab. Rubbish, for you. Not for many many others. Thus, having it an optional setting is optimal. * Get that link to the My Find Summary (paged chronological search of your own finds) in there, rather than just linking directly to the page of ALL find logs (left panel) which can load many many thousands of items on one page. Overall it's getting better. There's a whole lot of flexibility in the layout. But flexibility doesn't have to mean wasted space. The width detection for switching to 'mobile' view is set too wide. They just need to make a small adjustment to that so the pads/tablets don't jump to the tall/phone dimension view. Testable by adjusting the browser width on a desktop. Nearly 95 % of non information area on my laptop. That's nuts. Thanks for the great response. I'm not a professional developer, but I know enough about this stuff that I can understand what you said and it all makes sense. It'll be good to see how much things improve once the new optimized subsystem is in place. While I know it's not strictly necessary to tell us what's going on behind the scenes, many of us have a curiosity, and I think a decent number of us have even been in your shoes (more or less), and can identify with the challenges. Thanks for taking the time to elaborate. 5. There is inconsistency with the icon for recent logs - Found and DNF show an action icon (smiley face) but no cache type however notes, will attend, enabled etc show the cache icon type and no action icon (pencil, green tick etc). 6. Recently viewed - get rid of all the pictures depicting size and D/T this takes up two extra lines and looks messy and is not actually needed. If I have viewed it I know the details of the cache and if I have forgotten I can click the link again. All that is needed is the name, type and GC code and this can be on one line. If you do have to put this extra info it will be much better with D/T numbers rather than the pictures - everybody knows what these mean we don't need an illustrated description. 7. 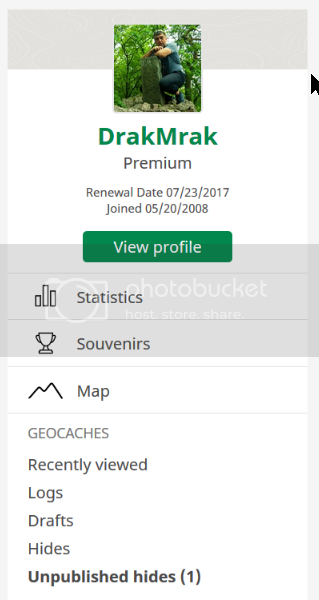 The huge profile picture and links to souvenirs and statistics is taking up valuable space at the top of the dashboard page. I doubt if checking souvenirs is something that anybody does on a daily visit (I only every look at them when a new one is gained and even then I don't always bother) so it does not need to be in prime position at the top which forces the other search links lower down the page. In my opinion souvenirs could move right to the bottom of the list on the left. 8. All text looks much bigger than it needs to be and lots of wasted white space. I have no problem with the old font. 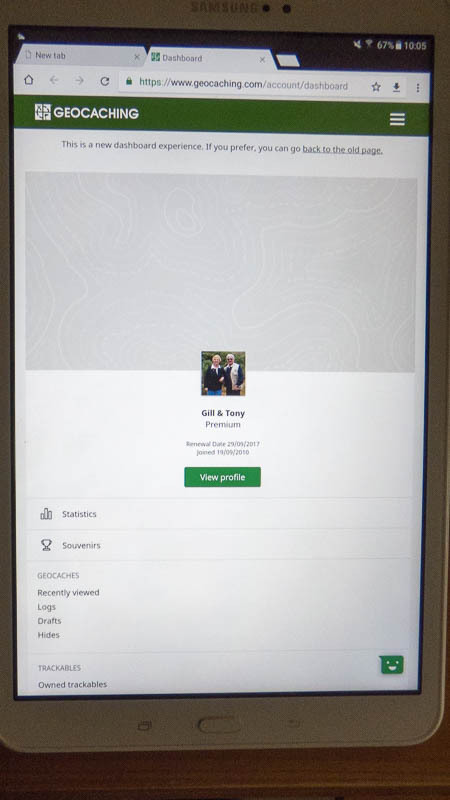 9 Profile page - 3/4 of the screen is taken up with a massive photo (glad it is square again) and list of number of finds, hides etc - this should be much smaller so the rest of the information appears on the page and does not have to be scrolled. I look forward to further updates - but most importantly please add a link to the map. Oh, I'd not looked at my public profile yet. This huge, blown up fuzzy user image is terrible! On my 28" work monitor I the first three lines of the caches found and hidden. Nothing else underneath. Um.. no, really no! Thanks for the thoughtful feedback. We're working on addressing many of the issues in your post right now. I'll go through them one by one. We are working on a better solution for the map access. There are plans to highlight it in the header, so you can access it from anywhere on the website and not have to click into the Dashboard to get to it. Unfortunately we are short on development folks in the front end department right now, so that work is taking a bit longer than we originally expected. We know it's an issue and are hoping to make it easier soon. We're looking into options on adding another link to this area that takes a user to the cache page. We just changed the designs to remove the 'YOU' from the page if you are looking at your own information. This will help with some of the white space too. Look for that change in the next few weeks. Thanks for the bug report! I have added it to our backlog to get that cache name in there soon. Yep! Agreed - we will be changing them out to be the log type icon instead, soon. I'll bring up your concerns with our UX designer. Even though you know what those numbers mean, we have to think of everyone who is looking at the page - including newer folks who may need a bit of a visual to help them understand what they are looking at. Regarding the picture, we have heard from many people that they wanted a larger picture back again, after it was removed a few of years ago - we're going with that for now. Regarding the links at the top - during the design phase we looked at the most used links and moved them to the top of the column. It sounds like you aren't necessarily in alignment with the majority, unfortunately. We'll keep checking the data to see what folks are using most and shift things accordingly. I completely understand that you are used to viewing a smaller text size, as most of the website is much smaller. Unfortunately, most of our website is not currently accessible for people that have any kind of vision impairment and that's not good. We are making strides to improve contrast, spacing, colors, and text size to make sure that we are up to current accessibility standards. American Foundation for the Blind says this about text size, "Large print type should be used, preferably 18 point, but at a minimum 16 point." All of our text in new development will be displayed at least 16 point to move the site toward meeting accessibility standards. Thanks for the feedback. We definitely know that we have more work to do on the Profile page. The first step was just to bring it out of our old code base. We'll be focusing on the Dashboard for the majority of the summer, but we know that we aren't finished with the Profile yet. I hope this has helped to update you on what we will be changing and answer some of your questions about why some of the changes are being made. Appreciate you taking the time to detail out what still isn't working for you. We're reading the forums everyday and listening to what the community has to say. [*]I'll bring up your concerns with our UX designer. Even though you know what those numbers mean, we have to think of everyone who is looking at the page - including newer folks who may need a bit of a visual to help them understand what they are looking at. When I first saw the icons, I though they were 1) a Speedometer 2) a Graph and 3) a Ruler. Even now I still think the first one looks more like a speedometer than a difficulty scale. One thing to consider about using graphics instead of words: you don't need to define strings that need to be translated into umpteen languages by the translator team. A cache size graphic means the same thing in Korea as it does in Brazil -- IF it's understandable. 7. ... Regarding the links at the top - during the design phase we looked at the most used links and moved them to the top of the column. It sounds like you aren't necessarily in alignment with the majority, unfortunately. We'll keep checking the data to see what folks are using most and shift things accordingly. Was this analysis based on the number of times users clicked on the various links? If so, I find it hard to believe that "Souvenirs" was one of the most heavily-clicked links. I would have expected that the PQ and list links would be far more heavily used. You may want to consider a less automated data-collecting method (e.g. survey, User Insight discussion, etc.) to collect more information about which features are considered most important by the users. Personally, the current order of the links isn't even close to what I would prefer (in fact, it's almost completely upside-down), so I'm not so sure your previous analysis is accurately capturing what the users actually want and need. 8. I completely understand that you are used to viewing a smaller text size, as most of the website is much smaller. Unfortunately, most of our website is not currently accessible for people that have any kind of vision impairment and that's not good. We are making strides to improve contrast, spacing, colors, and text size to make sure that we are up to current accessibility standards. American Foundation for the Blind says this about text size, "Large print type should be used, preferably 18 point, but at a minimum 16 point." All of our text in new development will be displayed at least 16 point to move the site toward meeting accessibility standards. That's understandable and good to hear, but the change from black to fifty shades of grey across the site's updated pages seems to work against this goal. Please consider using black text in as many places as possible. I'm fine with using graphics to aid in i18n, but like you said, it needs to be the right graphic. Personally, I can't understand the connection between what looks like a speedometer and the concept of "difficulty". I'm guessing it's supposed to convey the speed at which you should be able to find the cache, but I expect a new user wouldn't make this connection. Even experienced users may not understand the meaning at first. I can't think of a better icon off the top of my head, but I'm sure we can come up with something better. Using mountains to represent the terrain rating is probably the best choice, but there may be a better way of depicting them so it's more clear that they're supposed to be mountains. The current icon could easily be misunderstood to be a line graph with some unknown meaning. Maybe adding a snow cap would be enough? The size icon is another kettle of fish. A graphic has been used to denote that this attribute is for the size (a ruler isn't a bad choice here), but then the actual value is in text. Historically, the size value has always been represented by increasing sizes of square boxes as well as question marks for Other, dotted outlines for Virtual, and an X for the grandfathered Not Chosen. Even if it was hard for some people to understand the old size graphics, it seems strange to now move from a graphic to text that will need to be localized. Surely we can just come up with better graphic values? Edit to add: Maybe you should take the UX and graphic design folks, lock them in a meeting room with a non-HQ cacher, and don't let them all out until they come up with understandable graphics? [...] Edit to add: Maybe you should take the UX and graphic design folks, lock them in a meeting room with a non-HQ cacher, and don't let them all out until they come up with understandable graphics? Those are good representations of the concepts, but how do they look at 16x16? Too much detail might be lost at that small size. Regarding the picture, we have heard from many people that they wanted a larger picture back again, after it was removed a few of years ago - we're going with that for now. The larger picture we wanted back was not an enlarged version of the avatar icon though. Back then, the site supported two images, and they were used differently. The larger profile image was often used for a photo. The smaller avatar image was often used for a small and recognizable icon of some sort. One of the advantages of the web is that everyone can set their own font sizes. Those who need 18pt large print can set their browsers to use that. Those who need even larger fonts can use them. Those who are more comfortable with smaller fonts can use them. Of course, that works best when web sites leave the font size alone and use the default font size, whatever it is. But that has fallen out of fashion. Too bad. Fair enough, but I very much doubt anyone looking at those graphics for the first time would understand that the speedometer=difficulty, the line graph=terrain and the ruler=size; so they're not helping newer folks at all. A lot less scrolling! And leave "Geocaches" as a button to be pushed. Yup, agreed. The size icon was already an image, and well recognized in the GC.com context. I suppose the only difference is that it's not a single icon representing the size metric, it was a distinct icon per size. So perhaps the generic size icon could work having each size solid. Then again, the size is written as text next to the generic icon, so it's already localized, meaning why not use the size-specific icon images anyway? That to me honestly makes the most sense. Right now, with my iPad, the new dashboard is almost unusable, although I am assuming that will be fixed. In any event, the prominence of the links to statistics and souvenirs helps make it that way. I rarely check my stats and only go into souvenirs to hide the latest. I can't imagine going back and looking at souvenirs, but I do that from time to time with photos. The one thing I have always wanted - a link to the gallery - is nowhere to be seen. I am not sure that checking the data will help, since that link is not provided on the dashboard. I acknowledge that my caching might be atypical. The only thing that would make everyone happy is if the user could choose the links. I find myself going to the old dashboard simply because more information is readily available. Although a link to the gallery is not on that page either - for reasons I have never been able to understand - it gives faster access to most of the important pages. I'd have thought that practically the first thing anyone learns when starting caching is what D/T ratings and cache sizes mean. Does the dashboard really need to be compromised to cater for people who've never found a cache? 6. I'll bring up your concerns with our UX designer. Even though you know what those numbers mean, we have to think of everyone who is looking at the page - including newer folks who may need a bit of a visual to help them understand what they are looking at. But these newbies filled their Recently viewed list by visiting caches so they already know their D/T and size, just like experienced cachers. This info is relevant in the list of nearby caches - many of them are new to me and I for instance decide to view only the ones with terrain up to 4. Or I want to avoid micro caches. That's the place where it helps me. But not in Recently viewed - because I recently viewed those and am aware of their parameters.